A place of tranquil beauty amidst fine formal gardens, Lydney Park is home to Viscount Bledisloe, and is steeped in history from Iron Age to the present day. 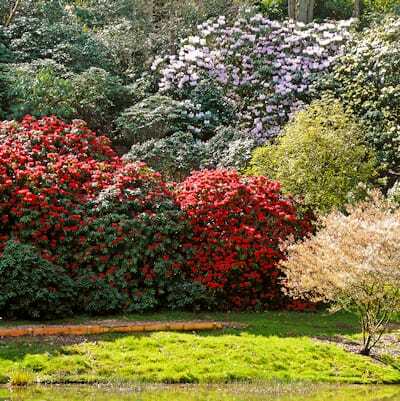 In early season, the visitor to Lydney Park drives between a resplendent display of daffodils and narcissi, and beyond the car park are the Spring Gardens, a secret wooded valley with lakes, providing a profusion of Rhododendrons, Azaleas and other flowering shrubs. Discover an important Roman Temple Site and the site of a Normal Castle. Picnic in the Deer Park amongst some magnificent trees, and visit our museums, which includes a New Zealand Museum. Admission Rates: Adults £5.00, Children 50p. Groups Rate: Minimum group size: 25 – Phone for group rates. Facilities: Tea Rooms, Roman Temple Site, Museums, Gift Shop, Plant Sales. Tours/Events: Tour of Garden can be made available. Booking Contact: Sally James, Lydney Park Gardens, Lydney Park, Estate Office, Old Park, Lydney, Gloucestershire, GL15 6BU. Location: Situated off A48 between Chepstow and Gloucester.